Silkscreened Spot Color Poly Letter Binders Poly Binders printed 1, 2, or 3 colors  : BindersNow.com, Quick, Easy & Online! Make a great first impression. Give your materials the introduction they deserve with custom graphics. Choose from many colors and textures of standard polypropylene (see below). 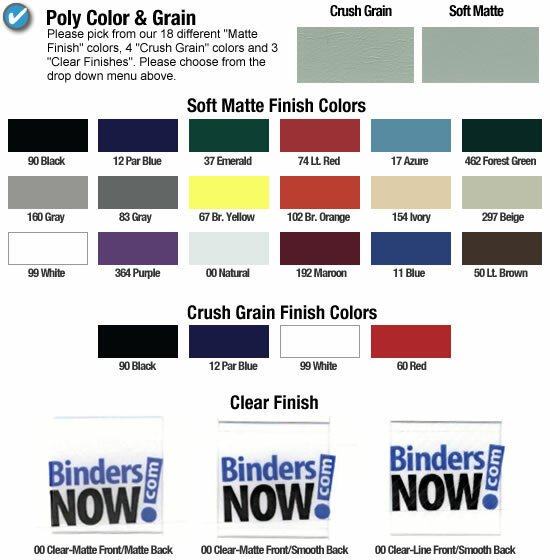 Your Binder: Pick from the many options below to create the binder that's perfect for your needs. To get an INSTANT QUOTE just skip step 1 and choose the options you want. Then add the quantity you want and hit the "add to cart" button to see what your unit price and total price would be. When you've decided what you want to order, download the appropriate template from the links in the table below and start designing your perfect binder. Like most things, the more you buy the cheaper binders get. We've included a pricing matrix below for your convenience. Download our art prep requirements for this product CLICK HERE.